Life Spring Community Health Ministry reaches out to families with uninsured or underinsured children in need of medical care. "The way we work with our uninsured patients is we raise support to cover the care we give them," said Life Spring Director of Nursing Jill Fikkert, an RN for the last 27 years. "That's why we are here. We started to be able to serve the underserved folks. We have people that can't give us anything and we don't turn them away." 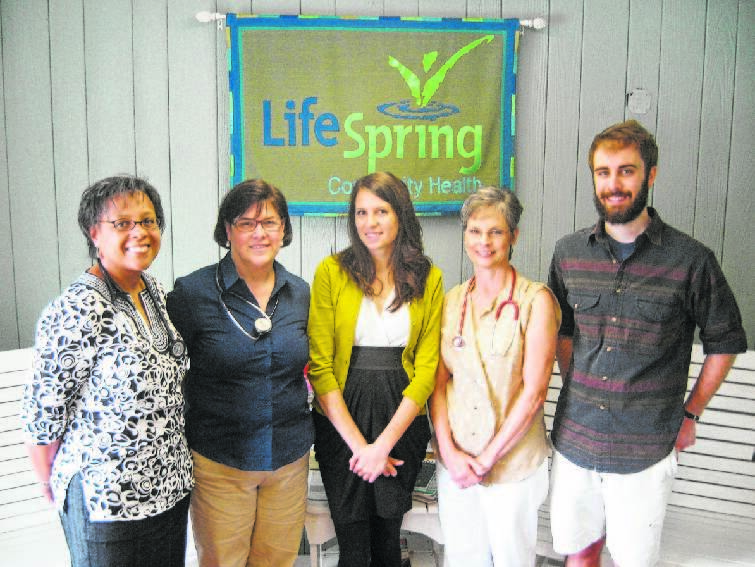 From left are Life Spring Community Health staff members Dr. Michele Pickett, of Glenwood, Director of Nursing Jill Fikkert, RN, of St. Elmo, office manager Beth Tinsley, of St. Elmo, volunteer registered nurse Lynette Hetzler, of East Brainerd, and summer intern Covenant College pre-med/biology major Wilson Ricketts, of Chattanooga. New mother Shuntella Carter, of East Chattanooga, brings her newborn 3-week-old Zanniah to Life Spring Community Health's Dr. Michele Pickett for checkups. "Coming here makes me feel better knowing she's healthy," said Carter. "No matter how much I call, they check her. It takes my worry away as a first-time mother." Dr. Pickett said Life Spring's demographics total 69 percent TennCare patients, 25 uninsured patients and 6 percent commercial private insurance. Those who can afford it are asked to pay $20 for a doctor's visit and $10 for a follow-up visit. "We have seen 300 individual patients since opening day last August," said Pickett, adding that the pediatric facility sees ages 0 up to 21. "We are different than most pediatric offices. We want to include a lot of patient education. We see a limited number per day so that I can spend time educating them on health. A lot of the patients we see need more resources." At a recent visit, she presented Carter with a book to read titled "What to Expect the First Year." "We want to provide holistic needs for patients and families," said Pickett, who began work as a doctor 23 years ago. "By the time they leave Life Spring we want them to be able to see a nurse, doctor and a community health worker, and this is our ideal." She said she is looking for a social worker or community health worker to make house calls to find out families' needs that need to be addressed. She said having a nutritionist on staff would also be great. "If we establish the practice and get it going, we feel that it will be self-supporting," said Pickett. "In a pediatric practice we do see patients over time. We have a long-term relationship with them. We try to affect a change in their thinking and attitudes. We don't expect them to go from drinking Kool-Aid to drinking bottled water overnight." Fikkert said many University of Tennessee students majoring in nursing and nutrition come to intern with them at Life Spring. "We want to be a place where kids in a disadvantaged setting can come to learn about health care," said Fikkert. "A lot of the kids that come to us have unique needs that take longer to address." She said the wait time in the lobby is short and the doctor's visit is long. Pickett said Life Spring is dedicated to carrying out the healing ministry of Jesus to bring about the restoration of body, mind and soul. "Our mission statement is to demonstrate the love of Christ in love and deed," she said. "You don't have to be a Christian to come here, but it drives and motivates us to do this. Our heart and burden is to help people without resources." Fikkert said Life Spring continues to apply for funding from foundations. The ministry began through the help of New City Fellowship Church within the walls of St. Andrew's Center in 2006 and incorporated as its own 501(c)3 later. Its new location at 2507 McCallie Ave., which it moved into in August 2011, is where Dr. Minnie Vance practiced for 58 years until age 88.